If your company is going to grow beyond the size that one person (You) can effectively manage alone, you’re going to need a team of functional leaders to help you manage it. But how do you find, train and prepare the leaders you’ll need to grow your company? It’s a big question. Once you’ve identified leadership potential in your employees, we think it’s important to work systematically to help them reach this potential. And it’s worth considering a structured plan to get this done, rather than developing your own training system in-house. There are many leadership training and development programs you can apply to help develop their skills. Most were originally created for the world of huge corporations, but some apply surprisingly well to smaller, service industry businesses too. One model we’ve used is Situational leadership. It is adaptable, easy to understand, and relatively easy to train. It provides a framework for how you engage your team leaders and how they can engage their teams, and it applies to virtually any work-related task. The core “revolutionary” idea behind Situational Leadership is that there’s no one “Best” leadership style you can train your leaders to always apply. Instead, the best leaders are able to adapt their leadership style depending on two situation-specific conditions. What work has to be done and how “performance ready” their team is to complete it. S1 – Team has no experience at the task. They are novices and need to be Directed – told what to do and how to do it. S2 – Team has limited experience with the task. They aren’t yet competent to do it on their own and need Coached to get it right. S3 – Team has enough experience but may lack confidence. They are competent but may need Supported, so they feel confident to act decisively. S4 – Team is self-sufficient. They are able to operate independently, and control can be Delegated in whole by leadership. 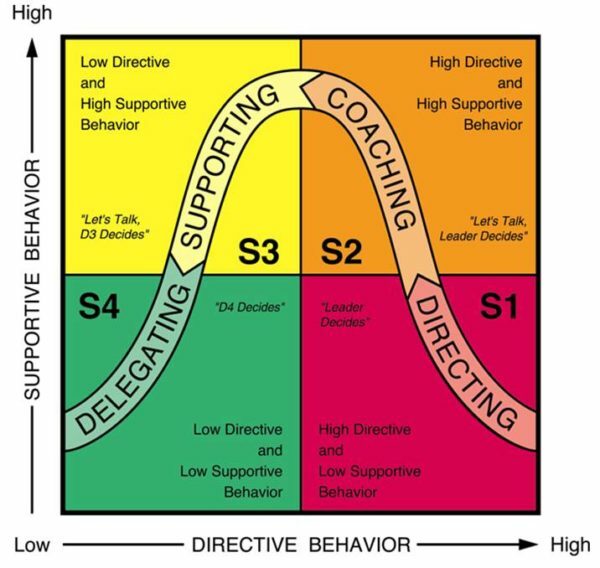 The Situational Leadership model is illustrated by the diagram above. The first step for many businesses might be for executive leaders to become effective situational leaders themselves. Then they can use the situational leadership model to train a core group of leaders who then also become effective situational leaders. Although this model may be best applied to your company’s management team, some experts suggest to expose your entire workforce to the model, so everyone is on the same page for how you manage your company. The basic construct is simple, flexible and easy to understand. It’s also easy to get started, yet there is a wealth of content and training available to help you get more and more out of it over time. It offers a path to progress ANY employee or team from beginners to experts, allowing leaders to effectively delegate tasks and hand off responsibility with confidence. It is a two-way model, where employees or teams can both progress and regress through the model over time, and it provides a framework to manage them at each step on the way. Leaders can tell teams how they are being managed and why, so teams can become proficient at specific tasks faster. Employees familiar with the model can even self-diagnose their own progress and help leaders decide how best to support them. What’s your favorite leadership program? Tell us in the comments. Good Luck ~ The Go iLawn / Go iPave team. Leadership: Developing Your Employees to Benefit Your Company. July – Time to think SNOW REMOVAL!